There are two types of scales commonly used on rulers; Fractional and Decimal. Fractional Rulers have graduations or marks based on fractions, for example 1/2", 1/4" 1/8", 1/16", etc.. Decimal Rulers have graduations or marks which are based on the decimal system such as 0.1, 0.01, etc. 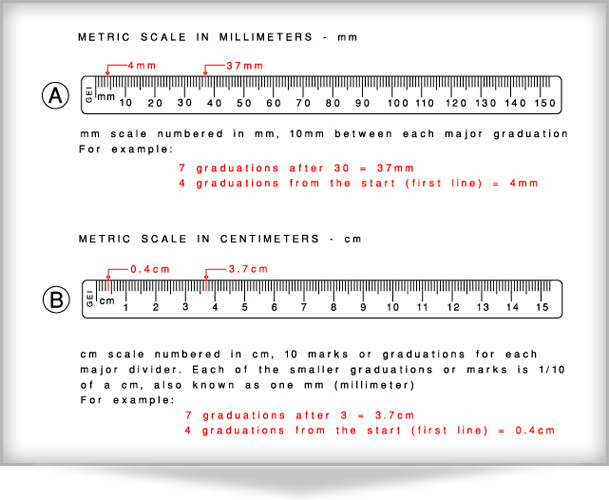 Decimal Rulers can be based on any measuring system but are usually based on either the English measurement system of inches (in) or the Metric measurement system of millimeters (mm), centimeters (cm) and meters (m). We discuss here, Decimal Metric Rulers using millimeters (mm), centimeters (cm) and meters (m). There are 100 cm in a m and 10 mm in a cm, thus there are also 1000mm in 1 m.
In the drawing below we show various options for cm and mm and how to correctly read the ruler; remember 10mm = 1cm and 100cm = 1m.